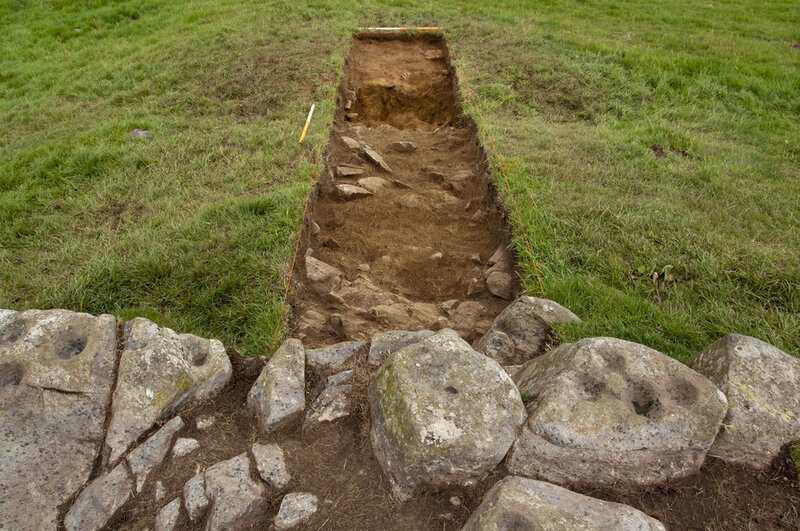 in Trench 2, I started to remove stones from the setting against the outcrop. The cup marked stone was the first, and directly underneath this was a concentration of charcoal. This was carefully collected for radiocarbon dating. The other stones in this arrangement were interesting. They were not carved with cup marks, but some looked like they had been quarried or prised from rock outcrops elsewhere. Most seemed to be were placed with their freshly quarried surfaces facing down. Some also had a distinctive colour, and one blue-grey slab in particular caught my eye. It was set up against the small outcrop and looked different to the other stone around it. I carefully lifted this slab. Just underneath was a large piece of worked quartz set against the surface of the outcrop. It was embedded in a patch of charcoal which was collected for dating. The slab with a deposit beneath reminded me of a feature I had found in 2007 while excavating at Torbhlaren, a rock art site near Kilmartin on the west coast of Scotland. Here, a large outcrop had a number of deep fissures. While excavating the soil within one of these fissures I came upon a disc of stone which appeared to have been set flat against the outcrop. Moving this stone to one side revealed a hollow. Lying within this hollow was a piece of worked flint. There is certain similarity between the slab features at Torbhlaren and in Strath Tay. At both sites it appeared that artefacts were placed against the outcropping rock and sealed beneath a stone. Trench 1, with the ditch now fully excavated, was cleaned up today for photography and 3D recording. This project took place in collaboration with Richard Bradley, Amanda Clarke, Ronnie Scott, Maria Cowie and Moyra Simon. Many thanks to the landowner and estate staff for their support.